Animals throughout the world take advantage of the shelter offered by hollow logs and stumps. They are easily found, take little energy to turn in to a home and offer shelter from the elements, but do not offer as much protection from predators as other types of animal homes. 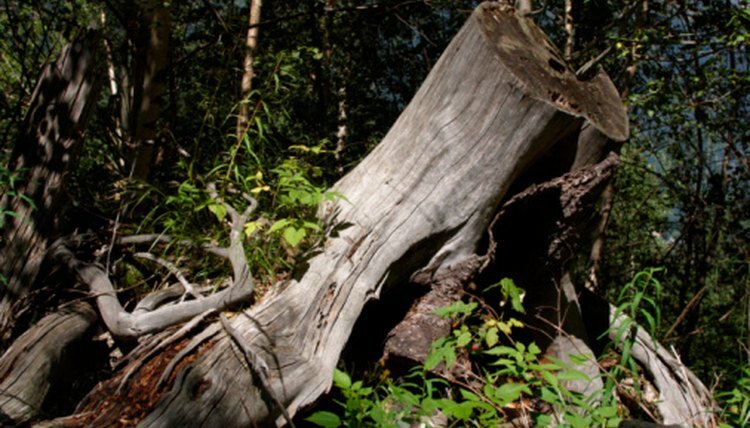 When looking for firewood in the forest, remember that there may be an animal in that hollow stump, or it may be an animal's home. Long-tailed weasels make their homes in hollow logs and stumps, as well as burrows they have taken over from animals they have killed. Weasels have long, slender bodies and tails, with short legs. Their fur is brown in the summer and completely white in the winter. They are found throughout much of the United States, southwestern Canada and as far as northern South America. They are aggressive carnivores, notorious for killing entire coops of chickens. Raccoons are adaptable animals that live in forests, farming areas and in cities stretching from southern Canada down to northern South America. In the wild ,they live in hollowed-out stumps and logs, as well as in trees. Raccoons have a characteristic black mask across the face and a bushy, black-and-white, ringed tail. Raccoons are nocturnal animals that eat almost anything, ranging from vegetation, to nuts and fruits, as well as crayfish and roadkill. Minks live in burrows as well as hollow stumps and logs. They are long, slender animals, with short legs, flattened heads and mostly chocolate-brown fur. Their habitat stretches from Alaska, down throughout Canada and most of the U.S. They are carnivorous, live mostly around water and eat mainly fish, crayfish, frogs and small mammals. Humans are the main predator of minks, trapping them for their valuable fur. Gray foxes are reddish gray and are easily mistaken for red foxes. Gray foxes make their dens in hollow logs and trees, as well as in caves. Gray foxes are found from southern Canada, down through most of the U.S. to northern South America. They are solitary hunters and opportunistic eaters, with a diet consisting of fruits, berries, rodents and rabbits. They are the only member of the dog family that can climb trees. Porcupines are found throughout most of Canada, as well as the western and eastern United States. They make their dens in hollow, decaying logs and trees. Contrary to popular belief, porcupines cannot shoot their quills, but they can embed them into predators through contact. They are excellent climbers and good swimmers. Their roughly 30,000 quills have hollow shafts, which help them float. Porcupines are mostly nocturnal herbivores, with a diet of leaves, twigs and plants.